Poop. We all do it. Some people even talk about it. But then again, so many people don’t talk about poop. To my more conservative, poo-shy friends, here are 3 reasons to reconsider your aversion to the matter. As Taro Gomi so lovingly points out in the beloved children’s book, Everyone Poops. Cats and dogs, birds and bees, boys and girls (no matter how they may protest), adults and kids — we all poop. Why not talk about it? We exist in solidarity with one another’s production of solids. Let’s share in the experience. Sometimes I just need my friends to ask how I’m pooping. This shows that they not only care for my emotional and psychological wellbeing, but for my digestive health, as well. If I come to you to complain about diarrhea, chances are pretty high that I value you as a friend and fellow human. I know a lot about my roommates. We’re very close. We tell each other everything — well, almost everything. Imagine how much more intimate we’d be if we could talk openly about our poop! I’m not asking for a mention in every conversation, or even every day, but just the option to talk about poop would bring such depth to our relationship. You’ll know more about me and I’ll know more about you. Everyone wins. When I was 12 years old, I sat in an Easter Sunday service at Blue Grass Church and listened to Pastor Doug explain this Jesus Christ guy in a way I hadn’t understood before. I was overcome with emotion and knew that I had to do something about what I’d heard, so I prayed with a friend and mentor and she helped me accept Christ into my life as my Savior. From then on, when people asked me if I was “saved” (ick) or if I had a personal relationship with Jesus Christ, I would refer back to that Easter Sunday and affirm that yes, I did know Jesus. I was never defensive, nor did I feel accused. I was confident in my story and confident in my relationship with the Lord. While I was on Summer Ministry Team, however, Jesus quickly started working in my heart to repair my false certainties. The Lord revealed to me that I had not been following him wholeheartedly at age 12, nor at age 13, nor at ages 14 through 18, in fact. He showed me the person I was in middle school and in high school, and he let me compare that person to who I am now. He held me close and tenderly whispered, You’ve got it all wrong. It turns out that, in fact, I was not a follower of Christ until September 18, 2014 (one year ago today) when I went to the altar after Rev. Stan Key’s message at Asbury’s Thursday evening Fall Revival service and told Jesus, All I am is yours. I surrender. I’ll do whatever it takes, to which Jesus promptly responded with exactly what it would take. He spoke to me in a step-by-step process, with step one being to break up with my boyfriend. Obviously I protested. Lord, you don’t understand, I prayed. I love him! I need him! Jesus answered ever so sweetly, That, my daughter, is exactly the problem. I knew that if I was going to go through with my commitment to the Lord, I would have to confess to someone in that moment what Jesus was doing in my heart, to tell someone who would hold me accountable to the steps I had to take to be all in for Christ. That night I went to Applebee’s with my roommate (holding back tears at the dinner table), excused myself for a moment, and called my boyfriend from the parking lot of the restaurant to break up with him. We both cried. It hurt so much. I was depressed for days after, when the world looked gray and gross and I was wading through heavy haze everywhere I went. The crazy thing about the depression, though, is that Jesus was right there with me. When I felt at my worst, he felt even closer. When I could barely get out of bed to go to class, he sang songs of healing and redemption over me. When I couldn’t sleep at night because my mind wouldn’t stop wandering, Jesus gave me the prayers to pray and the scriptures to read. Once I surrendered my life, I could feel the presence of the Lord meeting me exactly where I was, in the midst of my pain and confusion and hardship. And this summer, Jesus revealed to me that that moment is when I entered into relationship with him. I was not a Christian after I went to the altar on Easter Sunday. I was not following Christ when I jumped from relationship to relationship in high school, or when I focused on self-promotion and cancerous comparison. I became a Christ-follower when I surrender, and accepted Jesus not only as Savior, but as Lord of my life. I decided to let him call the shots, and I began intentionally obeying his commands, his call, his desires for my life. Now I know that being mistaken is not my whole life being a lie. Now I know that Jesus has been eagerly pursuing me since the beginning of time, and he continued to pursue me even when I thought I was already in a relationship with him. Now I know that September 18 is actually a really big day for me. Now I know that I am a daughter of the King, a follower of Christ, a servant to his Kingdom, and I’m in passionate pursuit of his will for me. Today we are heading from Collins, OH, to Hollow Rock Camp Meeting for the last 10 days of our tour. Instead of getting all sappy and nostalgic about the summer, I’ll just fill you in on how our week has been. When we arrived Saturday afternoon in Collins, we met at the church with Donna and Pastor Josh to go over the plans for the week before heading to get settled in at our host homes. Cliff and Micah stayed with Jerry and Florence, a very loving elderly couple who had lots of wisdom to share with our guys. Brandon and Conner stayed with Ron and Chicky, a couple whose hospitality goes above and beyond what we could ever have expected. Ron and Chicky made snacks for us every night after VBS and really loved on our whole team. The girls stayed with Brian and Casi, their boys Wesley and Collin, and their dog Scooby. Brian and Casi were incredible hosts, and a lot of fun to talk to and get to know. On Sunday morning we loaded up and went to the first of three church services. Ariane shared about our team and Acts 20:17-27, Kat talked about the story of Jonah, and Micah gave a bit of his testimony. Then we loaded up and went to West Hartland UMC and did the same thing all over again, this time with Christa giving her testimony. After the second service, we loaded up and went back to Collins to do it all over again — needless to say, it was a long morning. Afte r lunch at the church and some prep time for VBS, we all went back to our host homes for a power nap before we started VBS that night. The VBS theme this week was G-Force, which focused on God’s love in action. Kat and Ariane helped lead the songs each night, adding a whole new collection of kids’ songs to the team’s repertoire. Micah helped out in the craft room, Cliff helped with games, and Brandon took his puppeteering experience from last week and put it to good use playing the role of Checkers the cheetah puppet. When he wasn’t puppeteering, Brandon was helping with the preschoolers. Christa helped lead the 1st grade group, Conner and Ariane helped with the kindergarten kids, and Kat was a leader in the 3rd and 4th grade group. As usual, we all absolutely loved getting to know the kids, and saying goodbye Wednesday night was really hard. Our mornings were spent helping with odd jobs for the VBS like mapping a color run and sorting papers, followed by free time swimming, fishing, and even visiting Lake Erie. We got to visit with lots of families from the church and enjoy the wonderful weather this week… That’s sarcasm. The weather was bipolar and annoying all week. When the church found out we were a band, they asked us to play for them. We ended up setting up a full-band worship night in a barn Wednesday night and playing for an hour or so for the people from the church. They provided snacks and a fire pit, and we provided the music. It was an appropriate send off, and we really enjoyed getting to worship with them. Now we are heading to Hollow Rock Camp meeting to finish out our tour. As we go into our last 10 days, please be praying for supernatural endurance for our team so that we can finish well. Also pray that we would minister well at Hollow Rock. We are really looking forward to reconnecting with people we met at Finley, and to playing music together again. Thank you for your prayers and support! To those of you at home, we’ll see you soon! Picture: The barn made for an awesome set up for a worship night. I’ll start by apologizing for missing a whole week of blogging. Usually I blog in the van on the way to our next stop, but I was carsick on our last van ride and then I just kept putting off the task — but never fear! I’ll catch you up in this Prodigal Blog Post! Last week we were counselors at Joy of Living Camp in Brinkhaven, Ohio. The camp is out in the middle of nowhere with pretty much zero cell service, but oddly enough they have wifi for staff pretty much everywhere. The camp services mostly inner city youth who can’t afford to come to camp. Donors send money that it purposed for scholarships so that kids can come and have a camp experience. The theme for the summer is “The Sweet Life,” which focuses on the fruit of the spirit. We got to work with other counselors at the camp to lead groups of 8-12 year old kids through activities like challenge course, horseback riding, baking, team building, water games, and more. Since the camp only had jobs for 5 counselors, Kat and Cliff helped out with other jobs. Kat was on program staff, which helped the camp run logistically. Cliff, to whom we will now refer lovingly to as kitchen-boy-man-servant, worked in the kitchen helping Miss Dee prepare all of our meals. We loved getting to know and invest in the kids there, especially through teaching lessons and leading devotions. We really enjoyed getting to meet the other staff there, too, so much so that we convinced a few of them to come and visit us in Marysville during our break on 4th of July. We arrived Friday evening at our host home and were immediately blown away by their generosity and hospitality. Philip and Sarah took great care of us, let us invade their home (even to the point of having friends over), fed us well, and truly blessed us last weekend. We spent our break on Saturday exploring downtown Marysville with our newfound friends from Joy of Living. We went to a frozen yogurt place for lunch and an ice cream place for dessert, and then wandered around the area. In the evening a few of us went to the high school to watch the Marysville fireworks show. 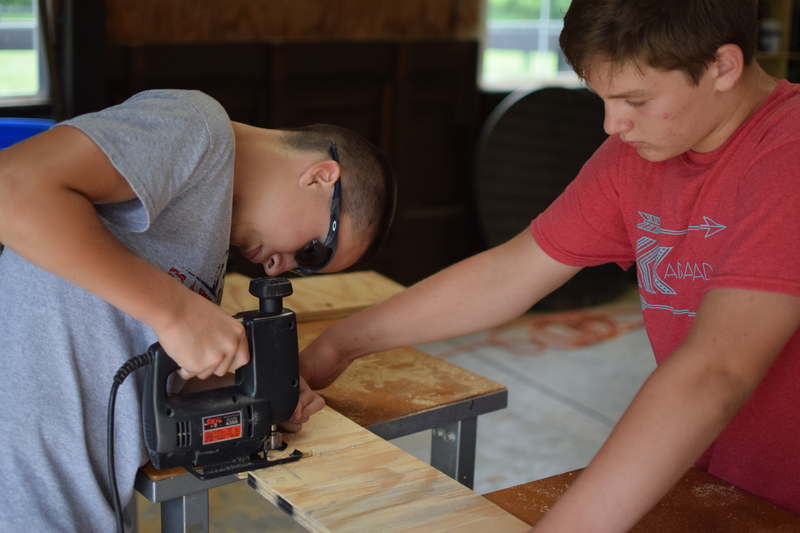 Marysville First United Methodist Church hosted a mission trip this week called Transformation Zone, an annual event where middle and high school kids from 10+ local churches come to do mission work for different ministries in the area. We lived in the church and went out to local ministries during the days to work. The kids were split up into 18 work crews of about 10 kids, and each of us (except Conner) was assigned to a work crew. Christa was with team 14 who went to the Willow Brook nursing home in Delaware, OH. 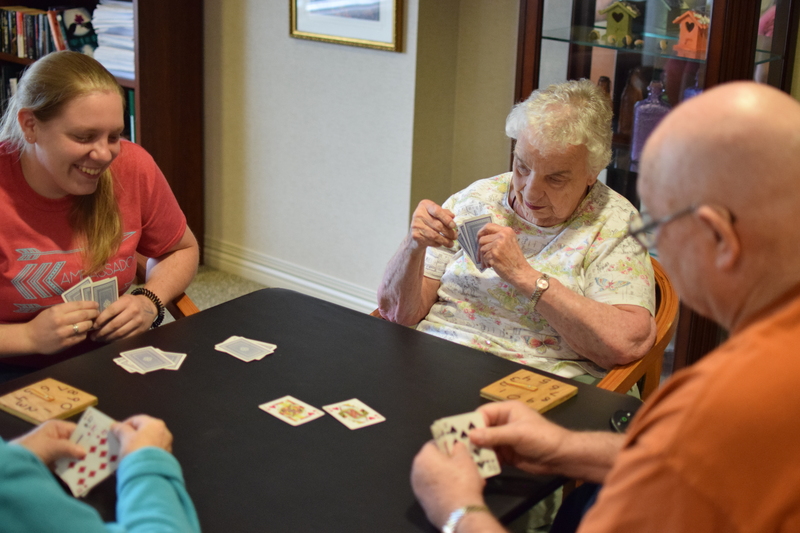 Most of the time, the team volunteered in the memory care unit where the residents with Alzheimers live. They took walks, played games and trivia, made crafts, painted pictures, read stories and talked with the residents. They also played uker and took walks with some of the residents in the assisted living unit. In the afternoons, the team washed wheelchairs. Brandon was in a work crew that worked with puppets. He had a great group of kids who worked hard and got along well. They did a couple of VBS visits and nursing home visits, where they performed their puppet show. Brandon was surprised at how well received the puppet ministry was. Micah went to Willowbrook Nursing Home in Dublin, OH, to visit with residents. They played Bingo and cards, set up a jewelry show for the ladies, and got to hear a lot of good stories from a lot of wise people. To the crew’s surprise, the residents at Willowbrook were just as interested in hearing the team’s stories as the team was to hear theirs. Ariane and Cliff went to the Furniture Bank of central Ohio. They painted and built different furniture pieces for individuals who were stable enough to begin to move into a home or apartment. The furniture bank never failed to have a job and enough for everyone to do. Ariane ended up really enjoying the work and Cliff got the satisfaction of working with power tools. It was a great experience making things that would really help families in need. Kat went out to a barn in the middle of nowhere to build bed frames for Bed Brigade, a ministry that takes beds to kids who’ve never had one. The beds were made completely from one piece of plywood and delivered with a mattress, bedding, and a Bible. Kat’s work crew was full of awesome kids who worked really well together, growing closer as the week went on and truly showing Jesus’ love to each other throughout the week. On Friday their crew went to deliver some beds to homes, which was humbling and beautiful. Conner was not assigned to a work group at Transformation Zone, so he took pictures or filled in with groups whenever a spot opened up. Tuesday he laid mulch, cleaned bathrooms, and played basketball with some kids. He usually lost. Wednesday he helped build kids’ bikes, a strange experience since many of the bikes had parts missing or defective. At the end of each day of work, everyone met back at the church for showers and downtime. We ate dinner together in the church, and our team led worship for the evening services. The middle and high school kids were very expressive in their worship, and every night was incredibly fueling for us as a team. Guest speakers came each night to share and teach on the theme for the week, being Christ’s ambassadors, and the church and a local radio station even hosted a concert on Wednesday! Overall we had a great week. Pray for endurance as we head into the home stretch of our tour. We only have two location left – Collins and Hollow Rock – before we head back to Asbury and disperse until school starts again. While it’s easy to feel the effects of our tiredness and start preparing to be done, we pray that we would push through and finish well, giving our all for the next two and a half weeks. Continue to pray that our ministry is received well by others and that we are effective ambassadors for Christ. Picture: The entire group gathers for a photo at Transformation Zone. We hit the ground running, as seems to usually be the case at new locations. We arrived around 5pm and started immediately setting up our sound system to play for evening worship at 8:45. Since the boys were also counselors, they ended up needing to go meet up with their groups while the girls stuck around and finished setting up the sound system (we nailed it, by the way). As is also usually the case, we neglected to eat dinner until after our worship set, so it was a pretty long day. We led worship twice a day at camp, once in the morning and once in the evening. The kids were middle schoolers who loves upbeat, fun songs with silly motions (we didn’t know many of those, so we added 4 new songs to our set list this week). In our off time the boys were counselors and the girls, well, jumped in wherever we could to get involved and hang out with the kids. There were plenty of dance parties, small group discussions, and games that Lended well to having a few extra college kids around. We fell in love with the kids — and the counselors! It seems to be a recurring theme that we leave a place loving the people there… Maybe Jesus has something to do with that. After a full week at Indicoso, we headed back to Asbury for the weekend, where we played background instrumental music for a few receptions and helped out with various kids camps here on campus for the Reunion Weekend (check out the big news at Asbury here). Pray that we would be prepared to do whatever ministry is needed of us, and that we would serve to the best of our ability out of the outflow of Jesus’ love for us and for the people we are serving. Pray that any insecurities or false voices amongst our team would be silenced. Pray that we would all know and feel how pivotal we each are to the team, and that we would not let Satan get to us with the lies of unworthiness or misfittedness (that’s probably not a word, but pray against it anyways). Pray that the Lord would multiply our rest, and that we would feel rested and rejuvenated even though we are only getting the bare minimum in hours of sleep each night. Pray that we would not let Satan use our tiredness against us, individually or as a team. Pray that instead God would use our emptiness as an opportunity to pour out his love and his grace. Thank you for your support and prayers. We are off to Joy of Living Ministries in Brinkhaven, OH, tomorrow afternoon.